College academic work can lead to job skills. Volunteer State Community College students had an opportunity recently to show off those skills at the statewide SkillsUSA competition in Chattanooga. Vol State students scored top honors in four categories and placed in several others. SkillsUSA is an organization that provides educational events, competitions, and programs that support technical and career education across America. The competition also connected students with businesses that need skilled workers. The Gold medalists will go on to compete in the national SkillsUSA competition in Louisville in June. Pictured: The Vol State competitors, left to right. 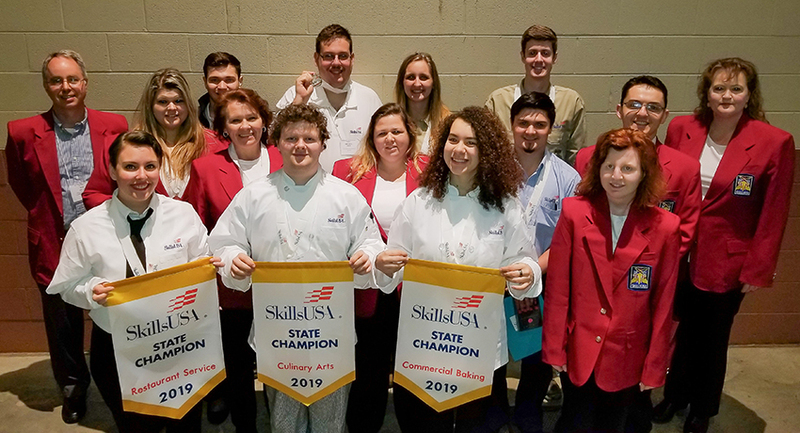 Front row: Jarissa Woolbright, Cookeville, Gold Medal, Restaurant Service; Preston Carr, Cookeville, Gold Medal, Culinary Arts; Hannah Foley, Cookeville, Gold Medal, Commercial Baking; and Delenn Strong of Gainsboro. 2nd row: Tim Dean, Mechatronics program director; BobbiJo Andrews, Cookeville, Gold Medal, Extemporaneous Speech; Melody Montgomery, Livingston, Bronze Medal, Prepared Speech; Pam Davis, Cookeville; Jarrett Talbott, Cookeville, Bronze Medal, Motorcycle Repair; Nicholas Drake, Cookeville; and Cindy Thrasher, assistant professor of Communication. 3rd row: Josiah Watson, Celina; Miguel Ortiz, Baxter, Silver Medal, Technical Computer Applications; Tallen Gooch, Sparta, Bronze Medal, Team Mechatronics; and Samuel Griffin, Sparta, Bronze Medal, Team Mechatronics.